As you know Snowbreeze is for Windows users only and if you don’t have access to Windows. However, you can use PwnageTool for tha same purpose on Mac. Below is a step by step guide to jailbreak all iDevices running iOS 4.1 and beyond (iOS 3.2.2 for iPad) using the latest Sn0wbreeze 2.1 (download links at the bottom of the post). Note : By using snowbreeze you will be able to preserve your baseband and use the current version of ultrasn0w to unlock. 1) Download sn0wbreeze 2.1 (download link at the bottom). 2) Download and install iTunes 10.1. 3) Download the required iOS firmware file for your iDevice. 4) When you open the sn0wbreeze, you see a splash screen saying that this software is not for commercial use. Click OK to continue. 5) On the next screen click on Browse button to select the required IPSW file downloaded in step 3. 6) Snowbreeze will verify the integrity of the iOS file. After that Click on the arrow on the bottom-right to continue. 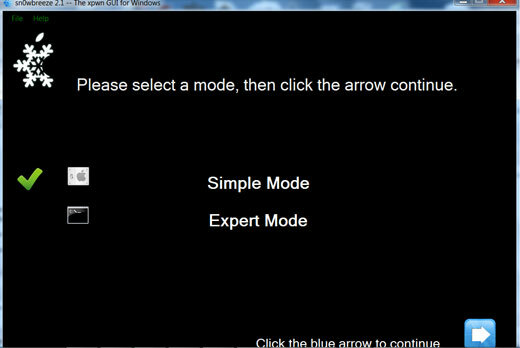 7) Select the Simple Mode and sn0wbreeze will start cooking the custom firmware. If you want to customize your firmware, select the Expert Mode and then select General Tab for more options. 8) After sn0wbreeze has completed its work, press the OK button to put your iDevice into DFU mode. 9) Follow the on-screen options to get into DFU mode. 10) Now open the iTunes and it will prompt you with a message that it found a device in recovery mode. Click OK to continue. 11) Hold down the SHIFT key and click on restore button. Choose the custom firmware cooked with sn0wbreeze. Make it sure that you select the right iOS firmware, the name starting with sn0wbreeze. When iTunes finishes its work, you will have a jailbroken iDevice running iOS 4.2. Feel free to ask any kind of queries and problems in the comments section below.